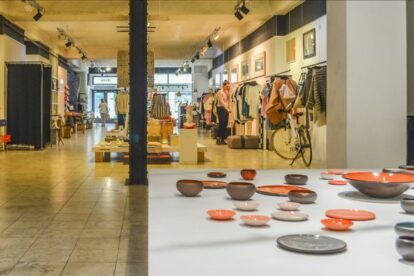 This shop is a gallery, design shop, downtown concept store and exhibition space and a peculiarity of contemporary design and fine arts. It’s the trendiest designer shop. When I’m looking for something to buy from a young Hungarian designer, I go to this place. You can find books and postcards, jewelry, porcelain, clothes and accessories here. They are fresh, exciting and unique. The owners, Judit Garam and Ákos Peleskey, want to introduce creators who have recently graduated from school but have already started their artist/business course in “real life”. Of course, individual and group exhibitions are not left out either. Some designers are my friends, and some I hope will become my friends. I have seen some artists who started here and nowadays I can’t afford their work anymore. In fact, it’s not such a cheap place, but it has great designs. You won’t find these things anywhere else.